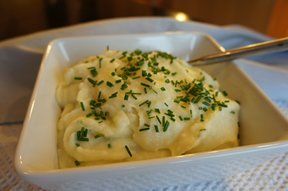 The roasted garlic mellows the flavor so nicely and this added to the mashed potatoes is perfect. You won't even have to top it off with butter since they are already so flavorful. Peel potatoes and cut in small pieces. Put in a large pot of salted water. Cook about 20 minutes or until done. Separate garlic cloves, but do not peel them. Place in a bowl, add olive oil and toss to coat. Place on baking sheet and roast in oven until soft, about 10 minutes. Cool slightly. 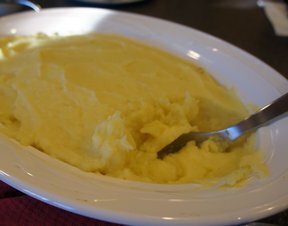 Drain and mash potatoes slightly. Add sour cream and butter. Squeeze pulp from garlic into potatoes. Mash potatoes until smooth, season as needed. Put into a serving bowl. Sprinkle with chives, if desired. "My daughter clued me in on roasted garlic and what a great flavor it adds. 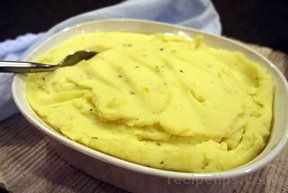 These mashed potatoes have that sweet roasted garlic in every bite. And are creamy from the sour cream."